A University of Maryland-led team is one of 22 student teams selected to advance in SpaceX’s Hyperloop Pod Competition. The selected teams will head to California this summer to test their design prototypes on the world’s first Hyperloop Test Track during Competition Weekend. SpaceX’s Hyperloop Pod Competition is designed to advance the Hyperloop concept for a new form of transportation in which passenger-carrying pods travel between cities through above-ground tubes at very high speeds. Pod speeds of up to 700 miles-per-hour could be possible because of minimal resistance created by low air pressure in the tube and by the use of pods that levitate on a cushion of air and/or magnetic propulsion. 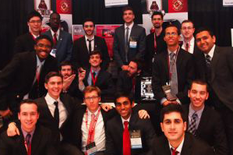 The 22 teams were selected during the competition’s Design Weekend held January 29-30, 2016, on the Texas A&M University campus. More than 115 student teams from around the world presented their pod design plans and were judged on a variety of criteria including innovation and uniqueness of design, full Hyperloop system applicability and economics, level of design detail, strength of supporting analysis and tests, feasibility, and quality of documentation and presentation. Mentored by UMD Department of Fire Protection Research Associate Noah Ryder, the multidisciplinary team includes more than 25 students from UMD’s A. James Clark School of Engineering and College of Computer, Mathematical, and Natural Sciences, and several students from Rutgers University who are heading up the team's electronics system efforts. Competition pod prototypes will be scaled-down versions designed to operate on SpaceX's aluminum plate and rail test track currently being built adjacent to the company’s Hawthorne, California headquarters. The UMD-led team’s proposed model will be approximately 3 feet by 11 feet and weigh about 800 pounds. If successful, the pod will be capable of safely reaching speeds of 220 miles per hour. One of the team's key design approaches is to leverage permanent magnets, which will cause the pod to levitate upon reaching 25 miles per hour. Design Weekend was attended by more than a thousand engineers, college and high school students, and even included a guest appearance by SpaceX and Tesla Motors Co-founder Elon Musk, who first outlined the Hyperloop concept in a white paper in 2013. For more information on the UMD-led team, visit rumdloop.com and follow the team on Twitter @RUMDLoop. For more information on the SpaceX’s Hyperloop Pod Competition visit www.spacex.com/hyperloop. This article first appeared in UMD Right Now.